The fate of six persons, who were nominated to the Haryana Civil Service (HCS) by the Chautala Government a few months ago, hangs in fire as the Hooda Government today withdrew requisition for 52 HCS posts from the Haryana Public Service Commission. An alleged bid to loot an industrial firm today was foiled owing much to the courage shown by an employee who died fighting the robbers. In another incident, a Senior Manager of a cooperative bank was allegedly shot at and robbed of Rs 15 lakh by gangsters today. With a view to grooming the local youth for a career in acting, two city-based artistes — Brajesh Sharma and Manish Joshi — are all ready to set up a drama school in the city. A dispute over Rs 50 led to the murder of a youth by his relatives at Mohana village, about 19 km from here, last night. Father and nephew of the deceased were also injured in the incident. Today was a tough day for the Haryana Agricultural University (HAU) Vice-Chancellor, Mr M.K. Miglani, as HAU teachers as well as students overwhelmed him with their demands and expressed their resentment over the alleged non-fulfilment of their long-standing demands. Former Haryana Chief Minister and HPCC president Bhajan Lal has said the Congress-led UPA government at the Centre and the party’s newly formed government in the state will complete their five-year tenure. Heavy rains and winds in the past 12 hours have left the farmers high and dry in the region. Untimely showers have damaged the crops and farmers fear bad days ahead due to the sudden change in weather. Mr Justice D.K. Jain will take over as the Chief Justice of the Punjab and Haryana High Court on March 11, Friday. The Haryana Board of School Education today denied press reports that the question paper for the subject of computer science for senior secondary examination held on March 7 was outside the syllabus. According to informed sources, under the rules the HCS posts are first filled by direct recruitment and only after that persons already in government service are nominated to the service quota posts of the state civil service. However, in this case the Chautala Government nominated six persons to the HCS before the commission could select direct recruits. The six persons whose nomination to the HCS has come under scanner are Mr Pirthi Singh, Mr Devi Lal Sihag, Mr Navin Ahuja, Mr Surinder Kumar Chahal, Mr Sarwan Kumar and Mr Varinder Sangwan. The case of Mr Sihag is curious. He was a Traffic Manager in the Haryana Roadways when the Election Commission recommended his suspension for allegedly campaigning for the then ruling Indian National Lok Dal (INLD) during the last Lok Sabha elections. However, his suspension was revoked by the Government after the elections and he was nominated to the HCS. Mr Navin Ahuja is a nephew of the former Transport Minister and President of the Haryana unit of the INLD, Mr Ashok Arora. Mr Ahuja was appointed in the Vidhan Sabha when Mr Arora was the Speaker. Later he was inducted in the HCS. Mr Sarwan Kumar was given the ex-gratia job of Assistant Secretary, Marketing Board, after the death of his father. It is alleged that the ex-gratia job was given to him by either amending or bending the rules. After he was nominated to the HCS, the government received a complaint that his Bachelor’s degree was not genuine. Now the government is likely to inquire about the genuineness of his degree. The other nominees to the HCS are also alleged to be close to the Chautala family. The sources say since the posts against which they were nominated, have been withdrawn by the government, these persons would also have to go. Haryana Chief Minister Bhupinder Singh Hooda will attend the concluding function of the World Jat Conference being organised at Youth Hostel, Chanaykapuri, Delhi, on Sunday under the aegis of the Haryana Jat Mahasabha. Stating this in a press note issued here today, the vice-president of the mahasabha Mr Ranbir Choudhury, said social, financial, political and other issues relating to the Jat community would be discussed at the conference. A leading builder of the USA, Mr Ram Swarup Arya, will be the chief guest, whereas the patron of the Akhil Bharatiya Jat Mahasabha and MP Gian Chand Pilania will preside over the conference. The two alleged incidents, occurring within short intervals of time, send shivers down the industrial and business circles of the district. In a daring incident, about 15 gangsters allegedly tried to loot an industrial unit — Santosh Casting Company— situated on the Pataudi road. The robbers came in two Tata 407 vehicles and most of them were stated to be well-armed. They allegedly barged into the company's premises at about 3.00 pm following which the proprietor of the firm, Mr Preetam Singh, called the police. A police team, comprising 10 CIA personnel, arrived at the spot. The team was followed by three other teams from the adjoining Manesar, Farukhnagar and Pataudu police stations. Emboldened by the arrival of the police teams, a munshi of the firm, Mr Radhey Shyam tried to confront the gang members who pumped bullets into him killing him on the spot. As the police gave the alleged robbers a chase, it was challenged by them and a gun battle, about half-an-hour long, ensued on the Pataudi road. However, no one was injured in the shootout and the alleged robbers escaped. The DSP, Headquarters, Mr Subey Singh said the police had launched an investigation and refused to comment further on the issue. No arrest had been made so far. Mr Preetam Singh, the firm proprietor, alleged that this was the third time that dacoits had targeted his company in the past one year. In the previous attempts, the robbers had been successful in committing the dacoity, he said. Although he praised the police for timely intervention, he expressed concern at the recurrence of the crime. In another incident, a Senior Manager of a cooperative bank was allegedly robbed of Rs 15 lakh near Badshapur, falling in Sohna Assembly segment, about 10 km from Gurgaon city. The incident was said to have occurred at about 1.30 pm. The incident happened when the manager, Mr K.S.Satishan, was coming from Sikanderpur branch of the bank and was carrying cash with him. He was travelling in a Maruti van along with another bank employee and driver. Their van was allegedly waylaid by six or seven youths, travelling in a jeep, near Badhashpur. The youths started firing on the van and the manager was hit by three bullets while trying to make good his escape. The robbers then fled from the site along with the van and their own jeep. They, however, abandoned the van at Durbaripur Chowk, about half-a-km towards Gurgaon city but took the cash lying in it. Mr Satishan, who was admitted in Pushpanhali hospital with the bullet injuries on his hand, was in a state of shock though stated to be out of danger. He expressed thanks to the almighty for saving his life. With a view to grooming the local youth for a career in acting, two city-based artistes — Brajesh Sharma and Manish Joshi — are all ready to set up a drama school in the city. Upbeat over their venture, Sharma and Joshi claim that this will be the first acting school in the state. Talking to The Tribune about their ambitious project here today, the young artistes say that lack of an organised effort on the promotion of theatre and acting skills in the state has prompted them to make a beginning in this regard. “We will charge a nominal fee to encourage the interested youths to join the school and develop a taste for the art form among them,” says Sharma, who has worked as a professional actor at the National School of Drama (NSD) in New Delhi for six years. Sharma, who did his MA in Indian Theatre from Panjab University, Chandigarh, has acted in a number of plays, tele-serials and films. He was in Mumbai lately, where he played roles in “Kahin Kisi Roz” being telecast by Star Plus, Gulzar’s “Godan” for DD-I and an art film, “Karvaan”, which was nominated for award at the Toronto Film Festival. Joshi did his PG diploma in dramatics from the Himachal Cultural Research Forum and Theatre Academy at Mandi, an extension centre of the NSD. He topped in designing at the institute. Joshi, a noted puppetier, has acted in 30 plays and directed 10. Sharma and Joshi maintain that they will provide extensive training in the disciplines of acting, music, camera work, lighting and set designing, besides preparing their students for the NSD entrance. They plan to start the school by the first week of April. “There is tough competition for admission to the NSD and merely 20 aspirants manage to clear the all-India test. In fact, in the past few years, nobody from Haryana has managed to make it to the prestigious institute,” says Sharma. These artistes simultaneously plan to establish a production house in which they will produce video albums to give some exposure to their trainees. Initially, they want to have a compact set-up and then expand operations, depending upon the response. But what about the financial aspect? To this, they reply that after the school is set up and they have a “name in the field”, they will look for private sponsors as well as government funding. As it is said, well begun is half done and seeing the optimism and enthusiasm of the artiste duo, no aim seems unachievable for them. A case has been registered against three persons and the body of the victim sent for a post-mortem examination. The injured were taken to a hospital and they are said to be out of danger. The deceased has been identified as Satish (25). Satish, his nephew Prem Singh, and his cousins Sunder and Ashok had gone to Bhakarpur village for attending a marriage party. They consumed liquor there. A sum of Rs 50 was left in the pocket of Satish when some relatives asked him to purchase liquor. Satish refused to do so. An altercation ensued. The matter was resolved after some members of the marriage party intervened. Thereafter, they joined the party and returned to the village. Satish narrated the story to his father, Budh Ram, who sent to the house of Prem Singh for making a complaint. Prem Singh, along with Sunder and Ashok, assaulted Budh Ram with bricks. Budh Ram raised the alarm and Satish came to save him. He was also attacked by Sunder and Ashok. He sustained injuries in the incident and died on way to the hospital. Some members of the HAU Teachers Association (HAUTA), led by its president, Dr M.S. 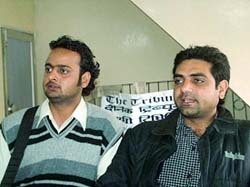 Narwal, staged a demonstration on the university premises in favour of their demands. The teachers were protesting against the alleged failure of the HAU authorities in getting their arrears released. Mr Miglani explained that he had brought the issue to the knowledge of the Indian Council of Agricultural Research (ICAR) authorities. They informed me that the matter pertained to the 9th Five-Year Plan, while currently the 10th Five-Year Plan was going on. The previous regime of the university did not pursue the case timely, leading to the lapse, he maintained. Meanwhile, a delegation of students also called on the Vice-Chancellor at his office with their bundle of complaints. Mr Miglani assured them that he would meet the new Finance Minister of the state soon and apprise him of their demands. Talking to newsmen at his residence here yesterday, Mr Bhajan Lal asserted that there was no threat to the UPA regime due to the recent political developments in Jharkhand and Bihar. Replying to a query, the state Congress chief maintained that the state government would not adopt a vindictive approach towards the former Chautala regime. He, however, added that the wrong deeds of the previous government would be probed and the guilty punished. On being questioned on the allocation of ministerial berths, he quipped that it was not practically possible to accommodate all MLAs in the state Cabinet. A visit by this correspondent in the district revealed damage to standing crops — mustard, barley, gram and wheat. Purshottam Singh had sown mustard in four acres of land. He had hoped of good crop due to favourable weather conditions but the sudden change in the weather has made him a worried man. “I had taken a loan of Rs 2 lakh in the hope of good returns but my hopes have been dashed to the ground. Rain is not good for the mustard crop, at this juncture he added. Another farmer said last season they had faced hardship in disposing of the cotton crop. He said government agencies had not given them ``appropriate’’ rates for cotton that had weakened their financial position. This season, he said, they were facing the brunt of nature. Talking to the Tribune, Mr Jagdeep Singh Brar, Deputy Director, Department of Agriculture, feared bad days ahead for the farmers. “Mustard is the main crop sown in the district and in the month of March heavy showers with winds are bad weather conditions. Now when seeds are being formed unwanted moisture will damage the quality and quantity of the mustardcrop,’’ said Mr Brar. The Deputy Director further said rains were equally bad for barley and wheat. He said untimely rain may bring more hardship to the farmers. The wheat crop may be hit by a fungal attack due to the moisture in the area. According to available information, Haryana Governor A.R. Kidwai will administer the oath to Mr Justice Jain, who is presently a Judge of the Delhi High Court. The warrants of appointment of Chief Justice Jain as the Chief Justice of the Punjab and Haryana High Court were issued some days back.